Sea Witch by Sarah Henning was released in North America on July 31, 2018, and promised to be a twisted fairy tale with a spin on “The Little Mermaid” that would be filled to the brim with plenty of plot twists and heart-in-throat action. Everyone knows what happens in the end. A mermaid, a prince, a true love’s kiss. But before that young siren’s tale, there were three friends. One feared, one royal, and one already dead. Ever since her best friend, Anna, drowned, Evie has been an outcast in her small fishing town. A freak. A curse. A witch. A girl with an uncanny resemblance to Anna appears offshore and, though the girl denies it, Evie is convinced that her best friend actually survived. That her own magic wasn’t so powerless after all. And, as the two girls catch the eyes—and hearts—of two charming princes, Evie believes that she might finally have a chance at her own happily ever after. But her new friend has secrets of her own. She can’t stay in Havnestad, or on two legs, unless Evie finds a way to help her. Now Evie will do anything to save her friend’s humanity, along with her prince’s heart—harnessing the power of her magic, her ocean, and her love until she discovers, too late, the truth of her bargain. 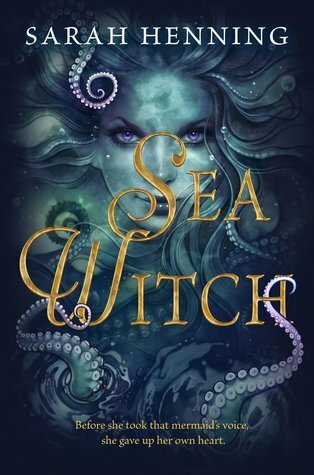 I have had a love-hate relationship with fairy tale retellings for several years now, and my opinion of Sea Witch by Sarah Henning is undoubtedly lukewarm at best. After finishing Sea Witch, I really went back and forth as to how I felt about it. On the one hand, I really enjoyed getting an in depth look into Urusla’s story, and what drove her to become the villain she was, but it didn’t quite live up to my expectations for it. Perhaps my favourite aspect of Sea Witch was its setting. The tale is set in 19th Century Denmark and is woven with hundreds of years of Danish history. Henning wove both real and fictitious characters and events together to create her setting and develop the culture of the Danish people, which was quite enchanting. For example, Henning combines the Danes real fear of witches on land with the story of the sea witch we all know from the Andersen tale. As a reader, I loved the setting because it was vividly described, and I felt like I was right there experiencing it with the characters. Henning undoubtedly put a great amount of effort and thought into developing the physical settings and the culture of the people residing in the world she was building, and this was reflected in the beauty and power of the setting Henning crafted. Furthermore, setting Sea Witch in a land far away added an extra layer of mystery and charm, creating the perfect tone for a fairy tale retelling! From there, my opinion of this novel begins its slow descent into mediocrity. First, I found the pacing of this story to be tedious at best. In all honesty, it’s a very slowly-paced book, especially during the first two thirds of the story. Any exciting fairy tale magic goodness a reader might be expecting happens in the later chapters, and even then it’s pretty bland. Then, there were the characters (Nik, Anna, Evie, Annemette, Iker, etc. ), who I couldn’t bring myself to particularly care about. Nor did I find myself particularly enraptured by the romance, mostly due to the poor development of the relationships themselves. Focusing on the characters, I can safely say that Sea Witch is about three unlikely childhood friends – Nik (the prince), Anna (the now deceased aristocrat) and Evie (the half-Italian fisherman’s daughter). Told by Evelyn, the story focuses on the three best friends who grew up in the small fishing village of which Nik will one day be King. Evelyn herself comes from a poor family with no title, but her aunt’s medical feats have allowed Evelyn to have a close relationship with Nik (and Anna before her untimely death), despite their different social statuses. However, their childhood misadventures resulted in Anna’s drowning, and the impact of Anna’s deqath continues to cause waves in their small fishing village – beyond what even the eye can see. As Evie and Nik struggle to adapt to adulthood and cope with the loss of their best friend, they find themselves increasingly enveloped in a magical net neither of them understand, even as it draws ever tighter around them. Evie is an intriguing protagonist, but the ease with which she is duped, and her generally good-hearted trusting nature make her POV frustrating to read at times, and result in most everyone else feeling like useless pawns in her never-ending series of poor decisions. Finally, as this was a fairy tale retelling, I really was hoping for more of a romance, especially since The Little Mermaid is at it’s core a romantic tale. But know that this is not a romance novel. The love stories are not developed, or even really explored at all (beyond the statement of their existence, of course, and the occasional kiss). If the reader is expecting it to have a romantic build up where they fall in love with the couple as the story is taking place, they will be sorely disappointed, because this is not that kind of story at all. Instead, Henning fell into the trap of instant-love, as many YA novels do, and it left me with a sour taste in my mouth. Overall, I just wanted a bit more from this twisted tale than Sarah Henning delivered, and unfortunately I found Sea Witch to be a tad disappointing. It is undoubtedly still an enjoyable read, and gives readers a fresh look at the beloved fairy tale (2/5). It’s such a shame, I really want to love this book but I’ve not seen a single positive review. It sounds like such a great concept but I need fast pace and action to keep my attention, I’m starting to think I may have to miss this one. I’ve yet to find a mermaid retelling that others truly rave about. I very much enjoyed To Kill a Kingdom by Alexandra Christo (you can find my review here : https://bit.ly/2FtE9y2)! If you haven’t read it yet, I would recommend checking it out.